Perfect success every time, for every artist. Perfect success every time, for every artist. Cheerful images printed with raised lines and shaded so that simply painting with water colors yields a realistic and visually satisfying picture. Details really pop! Color can be bold or delicate. 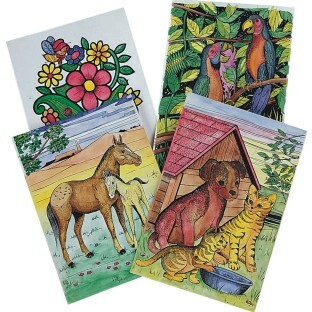 Includes 6 each of 4 designs on quality watercolor paper, non-toxic watercolors, brushes and instructions. 8-1/2" x 10-1/2". Used for seniors in assisted living and memory care. They enjoyed project very much. The raised lines gave them some guide but it still doesn't prevent painting over if they choose. LOVE these....well worth the price! Kids of all ages and abilities rock this project.